One concern about feeding elevated levels of liquid nutrients to preweaned calves is whether or not the practice delays and/or suppresses consumption of starter grain, making weaning more challenging for those calves. Researchers at the University of British Columbia recently performed a study to evaluate this question. The team presented their findings at the 2016 Western Canadian Dairy Seminar, and their work was published in the January 2017 issue of Journal of Dairy Science. In the study, 56 group-housed, week-old Holstein calves were allowed 6, 8, 10 or 12 L of milk daily from automated feeders until day 42 of age when this allowance was decreased by half. 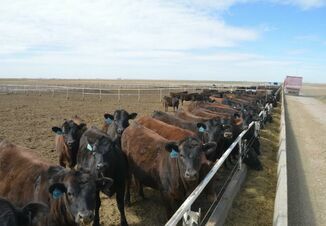 From days 50 to 55 of age, allowance was further reduced by 20%, and calves then were weaned completely on day 55 of age. Calves on the 10- and 12-L feeding programs had the highest average daily gain (ADG). The 10-L group gained 0.81 kg (1.79 lb.) per day; and the 12-L group gained 0.90 kg (1.98 lb.) per day. This compared to an ADG of 0.78 kg (1.72 lb.) per day for the 8-L group and 0.77 kg (1.70 lb.) for the 6-L group. Calves on the 12-L treatment had the fewest rewarded visits to the milk feeder (i.e. milk was available) at 6.7 visits per day, likely due to the large meal allotments when they did visit the feeder. Calves in the 6- and 8-L groups had the most unrewarded visits per day (i.e. no milk was available), at 9.7 and 7.0 unrewarded visits, respectively. Gain:feed ratio (kg bodyweight/DMI) was highest for the 12-L group at 0.76, followed by 0.73 for the 6-L group; 0.72 for the 10-L group; and 0.71 for the 8-L group. 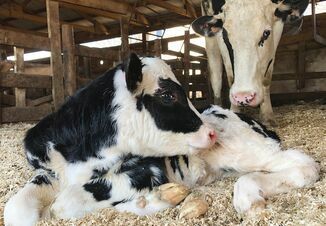 The authors concluded that although feeding less milk did result in more starter intake in the milk-feeding phase, gains and feed efficiency were better for the calves allowed more milk. The calves with the highest milk allowance consumed similar levels of starter grain after weaning. This resulted in a persistent weight-gain advantage - and higher overall weight gain and feed efficiency -- for the calves allowed the most milk. Previous studies have shown calves fed higher milk allowances lose their weight advantage during and after weaning, while this study showed a smooth transition off of the liquid diet. The authors attributed this to the type of weaning program, where milk was reduced part-way through the weaning program, and the socialization of group housing. A more detailed summary of the study, "The effect of milk allowance on behavior and weight gains in dairy calves," can be viewed here.